Slice two leeks, all the white, about an inch in to the green. Put in to the Thermomix with 30g of olive oil and sauté on 100 degrees, 5 minutes, speed 1. Peel two large potatoes, I could specify a type here, but I’m really not that savvy when it comes to potato species, so I will leave that up to your discretion. Roughly chop and add them to the Thermomix with 750g of chicken stock. Cook for 25 minutes, 100 degrees, speed 2. Add some salt and pepper, a pinch of nutmeg if desired, plus 250g of milk. Cook for a further 2 minutes, 100 degrees, speed 2. Add a good handful of some sharp, bitey cheese. Parmesan would be good, or a really old cheddar. Blitz it up slowly, until you get to speed 9, for at least 45 seconds. 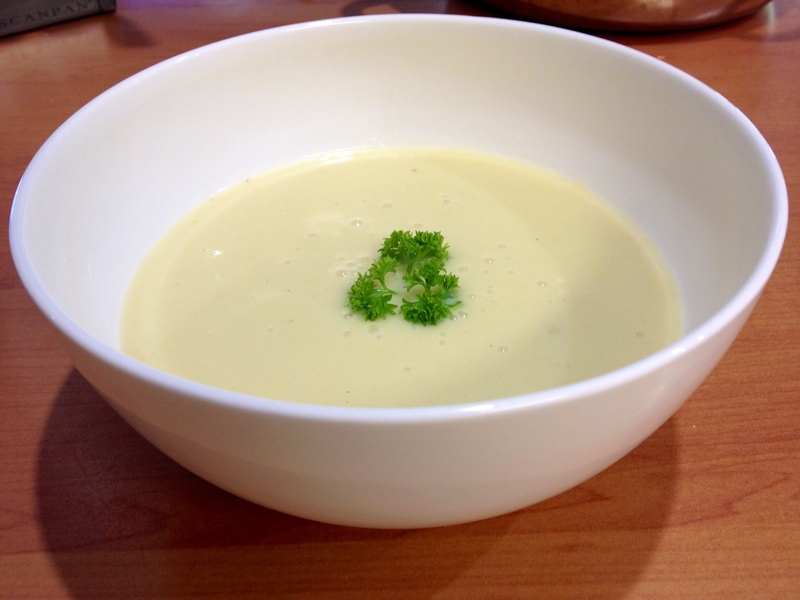 This entry was posted on Friday, November 16th, 2012 at 5:48 pm	and tagged with soup, thermomix and posted in Food. You can follow any responses to this entry through the RSS 2.0 feed.